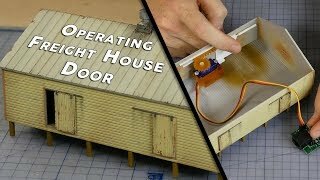 A complete guide on animating a freight house door for model railroad scenery and operations, no programming knowledge needed! Use simple components to electronically open and close the HO scale door. I’ll not only show you how to animate the door but I’ll also show you how to construct, paint and weather the model to achieve a professional finish that will be the envy of your fellow modelers. The Scale Modellers Supply paint I’m using in the video was sent to me specifically to be included in the video, it’s a great paint that I’ve previously used and to get the chance to receive some free products that I highly recommend was a bonus. It’s perfect for airbrushing and any general purpose paint thinner for lacquer paints will work well for thinning the paint. The weathering was accomplished with a combination of Scale Modellers Supply weathering powders and a selection of Vallejo Acrylic paints. The controller I used for animating the door was purchased from Servo City, it’s not a cheap controller however I have no idea what I’m doing when it comes to electronics and programming so having a controller that takes care of all the hard work with some simple pushes of a button is well worth it for me. All music is downloaded and licensed from Premium Beat.